ReadWriteWeb’s social Blog has an articule up referencing a conversation the author had with Mark Cuban about Facebook’s business model and integrity challenges. Apparently Facebook is now going to charge brands a huge amount to reach the base of fans they have accumulated on facebook. A few weeks back I as in a tweeted to a woman complaining how Facebook was shaping which of her friend’s updates she saw and even asking her to pay money to have her updates go to more of her friends. I said that when we had a federated social web she wouldn’t have this problem we would choose which of our friends we would follow and get updates from. I attended my 3rd out of three federated social web summits last week eek it feels like last week it was 2 weeks ago just after IIW 15. Evan Prodromo pulled together an amazing group of folks working on key aspects of the challenge. Tantek shared POSSE – Publish On your Own Site Syndicate Everywhere. Even gave an update on where OStatus the stack of protocols that gives you twitter and facebook like functionality across services. We learned about many other projects. too (you can see them on the wiki here). I’m glad that folks like Mark Cuban are waking up to the fact there is an issue with Facebook and they should be looking elsewere. Facebook is to social what AOL and Compuserve were to e-mail. It will be disrupted by the Open Standards based infrastructure must of it based on Open Source code. People will have their own personal node on the network – a personal cloud where they will connect to others and to organizations they want to share with, connect with and do business with. If you were to ask me what would get us to the future fastest though it is open source implementations of those open standards are invaluable and what “investors” like Mark Cuban and others who are now seeing the danger of one company “owning” the social profiles and identities of a billion people should consider funding now with no strings attached. I was asked by an investor group that I gave a day long briefing to about the the emerging Personal Data Ecosystem. I said I would give Evan Prodromo 12 million dollars no strings attached (as in you are not seeking a return on the money with more money) the deliverable for that money would be a working federated social web in 1 year. On that web one can build a huge variety of businesses and services in new ways not possible on today’s web (or at least not possible without creepy stalking and trackers and paying middle men like facebook to talk to your “fans”). That web itself…shouldn’t be “owned” it needs to be created though. 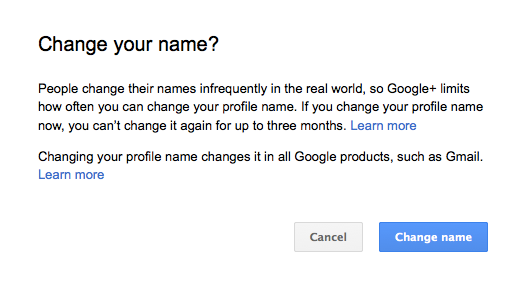 Today people were tweeting/writing about the new google+ names policies. Well. I just went through it and it involves many screens and an appeal into the Kafkaesqe googleplex that takes up to 3 days before they approve your name request. I think they should to this to EVERY user cause how do I know your name “is” David Smith…it just doesn’t trigger their dictionaries prompting inquiry into the legitimacy of your name…Ok but I digress…lets see how this works. First you are discouraged from changing your name and limited to the frequency you can do so. You have to click “change name” to do anything. The Nymwars and what they mean: summary of my posts to date. It is my right to choose my own name online and how I express it. Names and identities are socially constructed AND contextual… and without the freedom to choose our own names, and the freedom to have different names (and identifiers) across different contexts we will end up with a social reality that I don’t want to live in: Participatory Totalitarianism.